Data protection used to be a fairly straightforward process, but the arrival of virtual technology has changed that. Tools and techniques used to protect your physical data are no longer sufficient; an entirely new set of solutions is needed for virtual data assets. How do you know which technology is right for your organization? 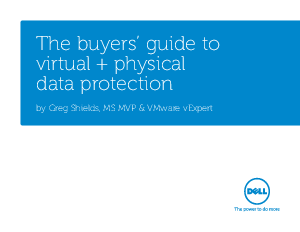 Let an expert do the comparison-shopping for you: The Buyers’ Guide to Virtual + Physical Data Protection.